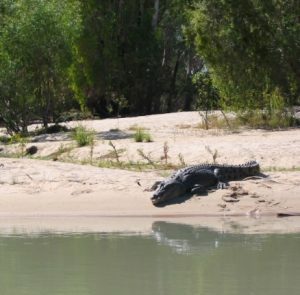 ‘No closer,’said the Aboriginal guide, not taking his eyes off it as it watched us menacingly from the surprisingly sandy shore of the East Alligator River. Having seen how they can surge and leap, I had a sudden clarity of vision sharper than any digital image. A few metres away was a whopping salt water crocodile. Enormous. Far larger than the one Roald Dahl wrote about that children bested. The guide poled our canopied dingy away from the river bank with an unexpected intensity before revving the motor for us to proceed. 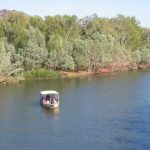 We were in Kakadu National Park, 20,000 square kilometres of rocky escarpments, savannah and wetlands an hour and a half’s drive east of Darwin. En route we’d passed acres of cultivated mango orchards, but at the Bowali Visitor Centre we entered the indigenous world where we read about the culture and history of the area and learned Kakadu has six distinct seasons, not only the dry and wet we southerners were familiar with. 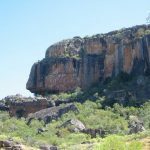 Within the Park’s boundaries are Ubirr and Nourlangie where ancient rock art of people, animals and hand prints can be seen as well as rock drawing of a boat with sails that Aborigines of this area witnessed long before other people arrived to settle. We stared out across the grassy flood plain stretching for miles to blue-mauve hills in the distance. In a windless pre-dawn we glided by boat across the still and inky surface of Yellow Water’s wetlands. 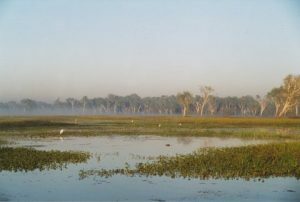 As the sun crept over the horizon the billabong and channels gleamed into activity with unfamiliar bird calls and the occasional splash. A ripple and a nose gave away a crocodile’s stealth while deep pink lotus blooms stood tall above lily-pad leaves. 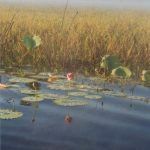 In the increasing warmth of the early sun mist rose languidly around paperbark trunks and rafts of vegetation as egrets stepped daintily on their spindly legs from one piece to the next, seizing their first fish or frog of the day. A crocodile, gripping its fresh yet un-gulped kill of pelican, swam past on its way to its watery storage larder, while we returned to our own breakfast as the sun rose ever higher. You bring this lovely part of Australia to life, Diana. Is the boat with the sail an Aboriginal boat? I haven’t heard of this before. Thanks for a wonderful post. It’s a European boat, Elise, presumably sailed by an early explorer – maybe Dutch. Extraordinary to see it on the rock.